The first time I saw Babaji, I was seventeen years old. I was in high school, eating from the Hare Krsna Cookbook, doing hatha yoga using Richard Hittleman’s books, and reading Autobiography of a Yogi and Be Here Now. I was an annoyance to my family with my dietary demands, sleeping on a mat on the floor in an empty bedroom. One day I was walking past Flying Monkey Store in Toronto and saw a magazine on a rack out front: Dharma Sara #1. I thought it was free, so I took one. On the cover was the image of a man who represented my ideal of the Himalayan yogi, beautific in features with an ascetic bearing. After reading the magazine from cover to cover, I put it aside. I was a student of Yogananda at the time and often visited Song of the Morning Ranch in Northern Michigan which was run by Yogacharya Oliver Black, Yogananda’s oldest disciple. 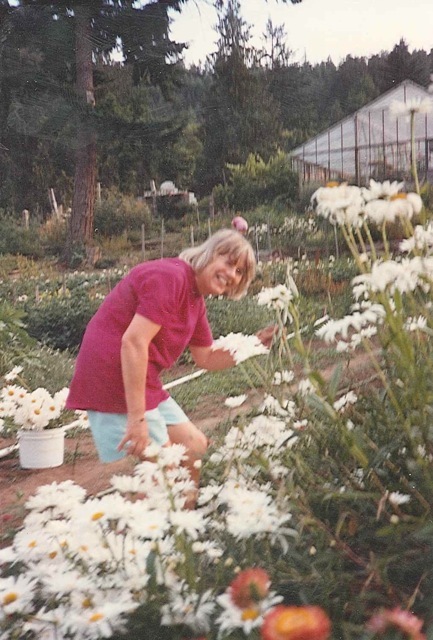 On moving to Calgary a few years later, I began working in Ambrosia Restaurant where we were deeply interested in Findhorn, akashic records and Alice Bailey. I also became good friends with Terry Willard, who taught me about tipi living and Native American herbs. I heard a rumour about Salt Spring Island and loaded my tipi poles to visit. I remember arriving in Vancouver and hearing that Babaji was in town before the Oyama retreat. I went to an address in Point Grey and knocked on Ravindra’s door late in the evening. I asked if I could see Babaji, but they said he was asleep (I was not a socially astute individual). After a short stay on Salt Spring at Tassaday Farm, and then on Gabriola Island I began living at the Shyamspace ashram in Vancouver. Mayana lived next door and she introduced me to the Dharma Sara Satsang. At my first satsang I heard Anuradha sing and that was it. I signed up! We were looking for land all over BC, when finally Sudarshan found the property on Salt Spring and we all chipped in for the down payment. That summer I finally met Babaji at the Camp Elphinstone retreat. Pitambar and Sumitra started farming at the Centre and I moved onto the land soon after, staying for about six months. 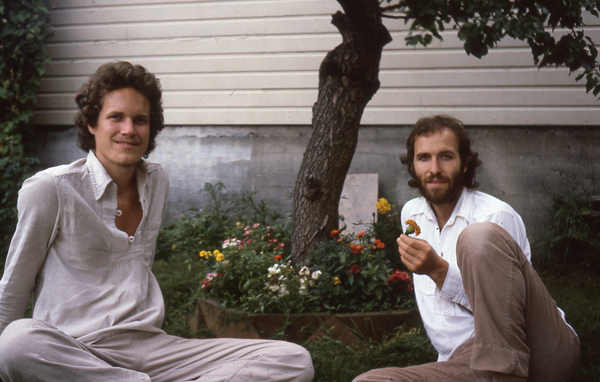 At one point Anuradha, Vidyasagar and I decided to make a tape in the Centre library of all the kirtan in the Wings of Breath book (which had recently been published) using two mikes and a cassette deck. We sold those tapes for decades. In the fall I fulfilled a dream and travelled to India, visiting places like Ladakh, Kulu, Rishikesh, Badrinath and Almora. I crawled into Hariakhan Baba’s cave in Pandukoli, met Lahiri Mahasaya’s grandson in Varanasi, and meditated in Yoganada’s attic in Calcutta. 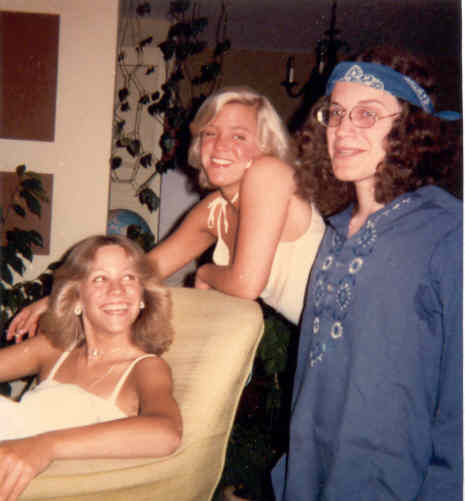 My sisters and niece came to retreats over the years and my mother, Savitri, stayed on the West Coast for several years. 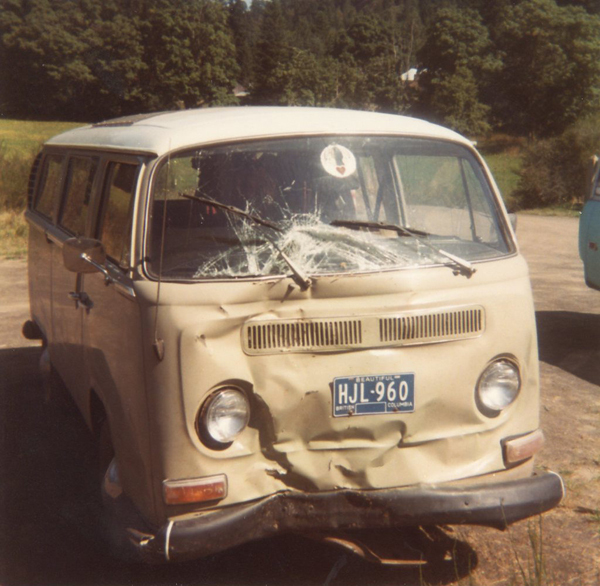 She helped me buy a VW van and I decided to teach her how to drive. We were on Blackburn Road, trying to turn around when she hit the accelerator instead of the brake and we smashed into the big fir tree by the driveway entrance! 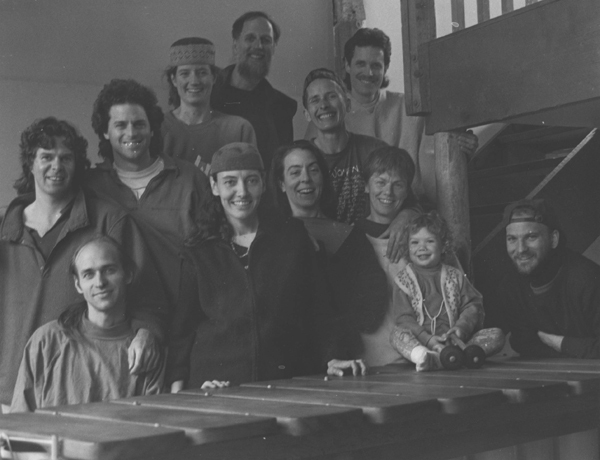 In 1985 I moved to Santa Cruz for a year, visiting Mount Madonna each week, learning to play beach volleyball, African drumming with Arthur Hull and building houses with Govind and his crew. I fell in with the artists down there and started taking drawing classes at Cabrillo College, finally returning to UBC to get my Fine Arts degree. 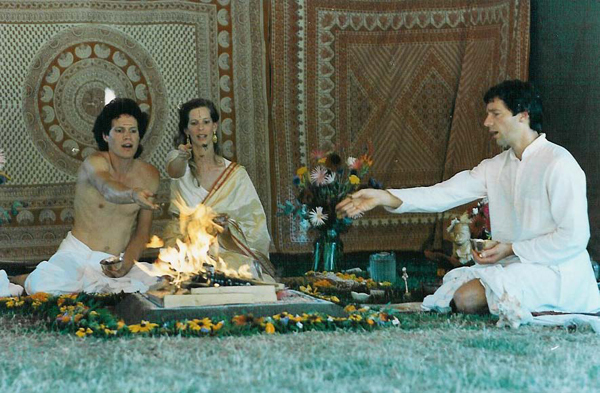 It was up at the Whistler retreat in 1988 that I met my wife, Sanjivani. 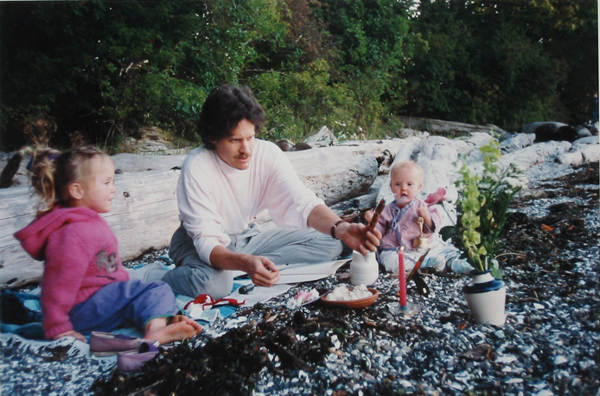 We moved to Salt Spring and had our first child, Sierra, in a portable yurt on Rameshwar’s property. Sanjivani was the administrator for the Centre School and one year they needed a teaching assistant, so I applied. I liked the work so much that I got my teaching certificate and taught the older kids at the school for the next six years. Usha was my teaching mentor and influenced the foundation of my educational philosophy. During that time, our family had a second daughter, Ashé, and bought property on Sky Valley Road while working daily at the Centre: I designed several of the buildings (the school, garden house and isolation cabin), did lots of plumbing and electrical, and served on the executive for a few years. I recall one year we had a big debate about dishwashing. I tended to avoid dish duty and researched the purchase of a commercial dishwasher, but suddenly there was a big resistance to this idea because dishwashing by hand was recognized as a social event. Several satsang members were in a marimba band that played around the island and at Saturday Market. My marriage took a sad turn and my ex-wife and children moved to Nelson. I went back to school to get my Masters degree and became a principal, initially in First Nations communities in Klemtu and Kincolith and then in Harrison Hot Springs. That’s where I have been working for the last seven years. 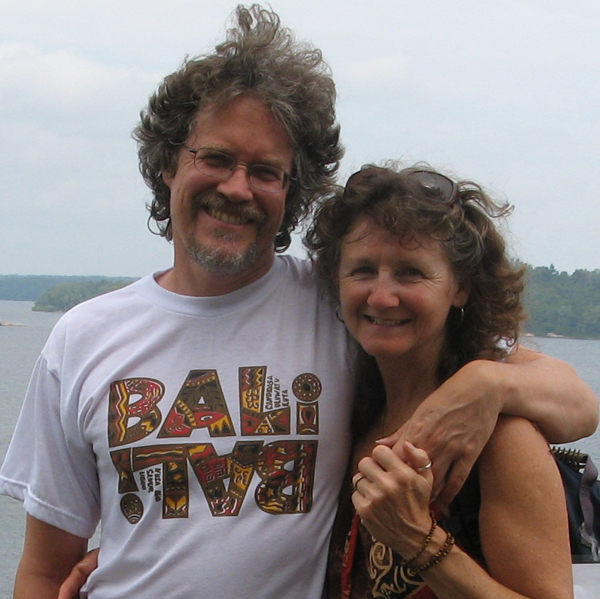 I have been blessed with Rajani’s companionship for the last 16 years and we like to travel the world, tend the garden on a small property on Mount Belcher and spend time in the wilderness on our little boat. I stay involved with the Centre as a sound technician, facilitating events, and telling tales at the Latte Da Stage. Although I was often on the fringes, I feel like the Centre has always been my root and my home community. I felt that Babaji’s teachings were simple, clear and concise. In the early years, I thought it was my duty to be “official questioner” during Question & Answer, but with time my mind settled down and I could abandon that compulsion. With the assistance of my Centre friends and the buffeting of life’s events, I feel that I have softened the arrogance of my youth and feel comfortable slowly becoming an elder. 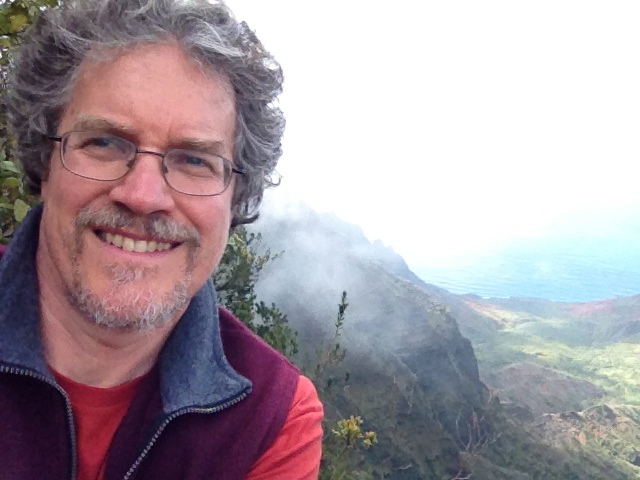 8 thoughts on "Our Centre Community: Mark Om Prakash Classen"
What a nice gift, to share your expriences with yoga and the community! We greatly enjoyed the words and photos. Sorry we couldn’t make the SS retreat this year, will be there in 2014. @Dayadhar: We missed your presence this year and lick our lips in anticipation of next year’s arrival. 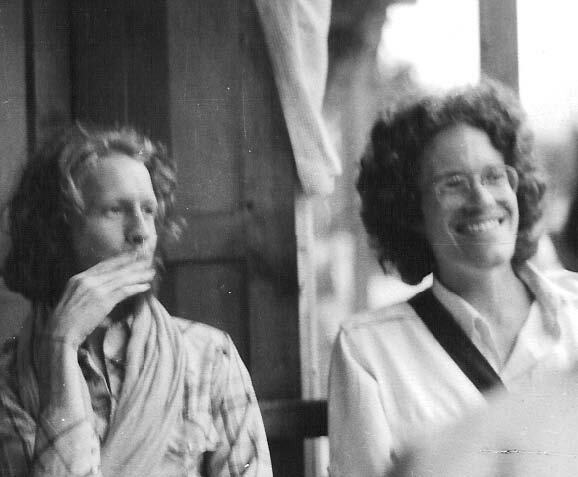 @Anna Zach: I was doing kirtan at the Colorado Springs conference in 1984 , I think, but 1975 would have been too early in the morning for me! How wonderful to hear your story and see the pictures. 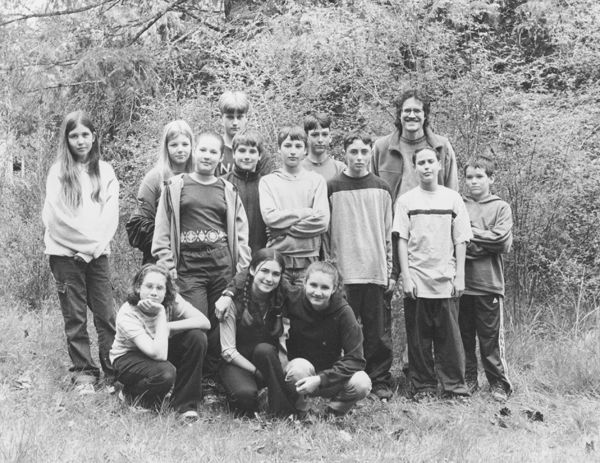 Lovely memories – and photos. You don’t look the same as you did when you were 19, but I’d swear the way you look hasn’t changed one iota since 1979 – that may be my eyesight. But the way you Be Here now has developed within you affected by being around yoga into an influence for the benefit of others. It’s been so good to know you. I thank you for that. I loved the typo – probably an undetected autocorrect – that transformed Babaji from the beatific being he is and be’s, to the beautific. Joh Lennon would have appreciated that one! I loved the typo – probably an undetected autocorrect – that transformed Babaji from the beatific being he is and be’s, to the beautific. John Lennon would have appreciated that one! 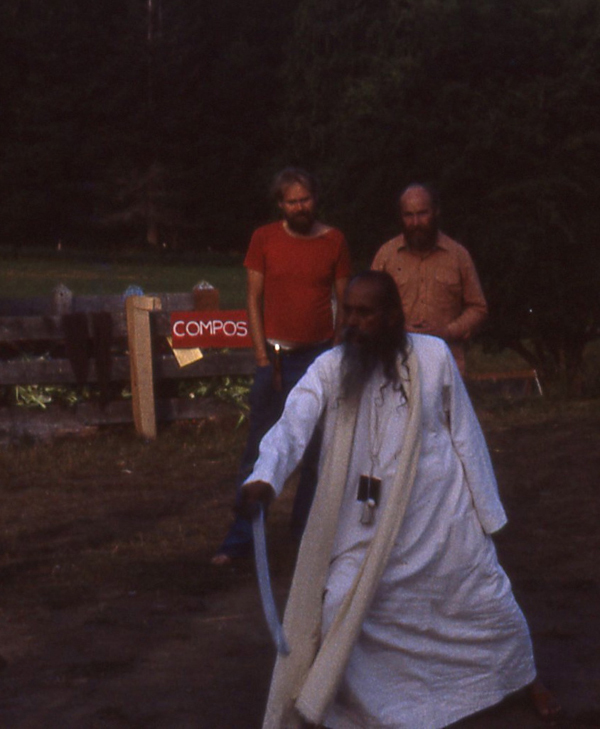 The photo of Babaji at sword-play with Sri Nivas and Mahesh in the background also has a compost bin – and its sign. There’s a story behind that sign. It resembles many another sign around The Land in that era (and the many individual personal chalkboards the children in the school were equipped with – not only for when they were on mauna, which was remarkably often (every school should try it), but also used daily by them the same way schools of old had slate-boards (we were crucially short of paper). Bright red signs with white writing were the sign of an internal playful war between two factions – a minority that LOVED the red-painted hardboard ceilings on the main floor, and the way larger faction that tore them down pronto, and put the red to better use. It is quite odd how rich every old photograph can be with scraps of half-forgotten memories – of people as well as stories. Somehow those red signboards and the mini chalkboards bring Vidyasagar back to me – he did so love to act the grump while secretly endowing the school with many a thoughtful gift for the children’s well-being. Perhaps he drilled those holes in the chalkboards. I know he carefully constructed, out of building scraps, long worktables just the right height for small children seated yogi-style cross-legged on the floor. Memories from a compost bin!